When I received my review copy of The new Artisan Bread in Five Minutes a Day, I didn't know which recipe to tackle first. Initially I wished to feature the olive bread to illustrate our day to day life. We always have bagels with cream cheese, multi grain and multi seed bread toasted with jam in the morning, pita with hummus as a snack and olive bread with feta and sliced tomatoes on top with a dash of salt as a lazy lunch. As we all know there's nothing day to day or ordinary about this time of the year as we prepare for the holidays, so I decided to feature this gorgeous Italian panettone instead. Although I do not celebrate Christmas I love the Christmas baking traditions, whether breads or cookies, and always wished to feature this classic Italian Christmas bread on Food Wanderings. 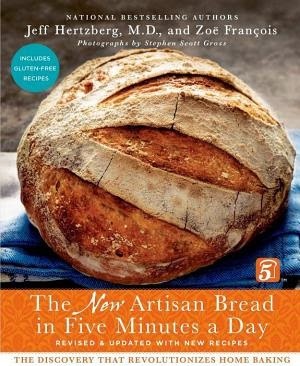 Jeff Hertzberg and Zoe Francois, the authors of The New Artisan Bread in Five, have been long time social media friends, so I am happy to share their gem of a book with you all. As you know I love baking with yeast so I am always happy to come across a book that teaches me new methods and tricks. The New Artisan in Five simplifies the bread baking process and makes bread baking more accessible to fit into our ever so hectic lifestyles. The photo of the panettone in this post is from The New Artisan in Five. It is so stunning that I didn't even bother snapping my own when I baked the panettone. The book includes 40 mouthwatering color images and 100 black and white how-to photographs. The New Artisan in Five has an entire gluten free chapter which is welcome news to those of you with gluten intolerance. I like The New Artisan Bread in Five so much that even sent it to a friend as a Christmas gift through Amazon. She should get it by tomorrow. I am super excited to offer The New Artisan Bread in Five Minutes a Day cookbook GIVEAWAY available for shipping worldwide, in the US and Internationally. The GIVEAWAY will run from 12am EST on Thursday 12/05/13 till 12am EST on Thursday 12/11/13. The one lucky winner will be selected via random.org and will be notified shortly after the giveaway is closed. The review and giveaway copies were a courtesy of St. Martin Press. All photography is Stephen Scot Gross 2013. Recipe from The New Artisan Bread in 5 Minutes a Day by Jeff Hertzberg and Zoe Francois, copyright 2013, and reprinted here with permission from St. Martin's Press. Panettone is the classic Christmas bread sold all over Italy during the holi- days (see color photo). It originated in Milan around the ﬁfteenth century, and has been the subject of much lore. The most commonly told story of how this bejeweled bread came to be goes something like this: A young nobleman falls in love with a baker’s daughter named Toni. He disguises himself as a pastry chef ’s apprentice and creates the tall fruit-studded bread to present to Toni, calling it “Pan de Toni.” The bread is a success in the bak- ery and the father blesses the marriage. The story is as rich and fanciful as the bread, made with dried fruit and the essence of lemons and vanilla. There are traditional panettone molds that are very high sided and come either straight or ﬂuted. They can be found at cooking stores or on the Web. You can use a brioche mold, but the bread won’t have the classic high sides. Paper panettone molds are avail- able from baking supply stores. Makes at least three loaves slightly larger than 11 ⁄2 pounds each. The recipe is easily doubled or halved. Mixing and storing the dough: Mix the yeast, salt, honey, eggs, melted butter, extracts, and zest with the water in a 6-quart bowl or a lidded (not airtight) food container. Mix in the ﬂour and dried fruit without kneading, using a spoon or a heavy-duty stand mixer (with paddle). If you’re not using a machine, you may need to use wet hands to incorporate the last bit of ﬂour. The dough will be loose, but will ﬁrm up when chilled (don’t try to use it without chilling). Cover (not airtight) and allow to rest at room temperature until the dough rises and collapses (or ﬂatten on top), approximately 2 hours. The dough can be used as soon as it’s chilled after the initial rise, or frozen for later use. Refrigerate the container of dough and use over the next 5 days. Beyond that, freeze the dough in 1-pound portions in an airtight container for up to 2 weeks. When using frozen dough, thaw in the refrigerator for 24 hours before using, then allow the usual rest and rise time. On baking day, grease a 6-inch panettone or brioche pan with a small amount of butter. 11 ⁄2-pound (small cantaloupe-size) piece. Dust the piece with more ﬂour and quickly shape it into a ball by stretching the surface of the dough around to the bottom on all four sides, rotating the ball a quarter-turn as you go. Place the ball into the prepared pan, seam side down. Allow to rest at room temperature for 90 minutes, loosely covered with plastic wrap. Preheat the oven to 350°F. A baking stone is not required, and omitting it shortens the preheat. Remove the plastic wrap, brush the panettone with egg wash, and sprinkle top generously with sugar. Bake near the center of the oven for 50 to 55 minutes until golden brown and well set. The amount of dough and baking times will vary depending on the pan size. I love some chocolate in panattone. I'm a bread baker from way back. 25 years at least. I have bannetons, couces and willow baskets. Focaccia, scones, pain au levain. But in recent years I've mostle done no-knead bread, both from Jim Lahey's method and from Jeff and Zoë's (Minnesotans, you know). This panettone looks wonderful! A great giveaway and beautiful panettone! I LOVE Panettone... I was actually born and brought up in Milan, the city where it was created and have eaten plenty throughout my life. To me there's no Christmas without Panettone! :-) Great looking book! I love baking bread. I don't get to do it as often as a like anymore because I have a 3 month old. Artisan Bread in 5 Minutes a Day is my go too recipe for great bread. I also enjoy baking quick breads. Everything sounds better in Italian. If you gave me fruitcake, I'd use it as a door stop, but panettone? All I can say is Mm, mm, mm, mm, mm! Seeing as how I'm not a baker, though, I'll have to buy mine (or, even better, win the giveaway!). And p.s. Who doesn't LOVE bread? What a groovy cookbook! If I win, I'll give it to my hubby, the family baker. This book looks awesome Shulie, am a fan of Zoe's bake via IG n FB, no doubt this book is a treasure. This book has been on my wish list. I love fresh baked bread and find the smells of bread baking in the house so comforting! I love baking bread. This book looks amazing! I'm inspired to make Panettone this Christmas! What a treat! I've attended a few types. I loved the first version of this book -- I made brioche with it! I have been baking bread for about two years now. I started with a bread machine and then purchased the original Artisan Bread in Five and ever since, freshly baked breads have been a staple in my house! It's been wonderful to whip up a batch of dough and have enough to eat on for weeks at a time. I do make regular yeast breads as well - my Parker House Rolls and Hamburger Buns make regular appearances at my house. Baking is magic. Baking is creation. Baking is therapy. Baking is what I do when I feel the best, and the panettone in this post made a dear friend think of me and point me to it - I have been making my own panettone for years, unable to get the real thing here. This book is made for me, and I really hope I win the giveaway! As long as I can remember growing up we mostly ate my mothers rustic village bread... nothing compares to it. Now I make a variety of breads from lovely cookbooks and delicious food blogs, it would so wonderful to add this one to my collection. I love all things bread and have enjoyed baking recipes from the original 5 Minutes cookbook...would love this revised version. 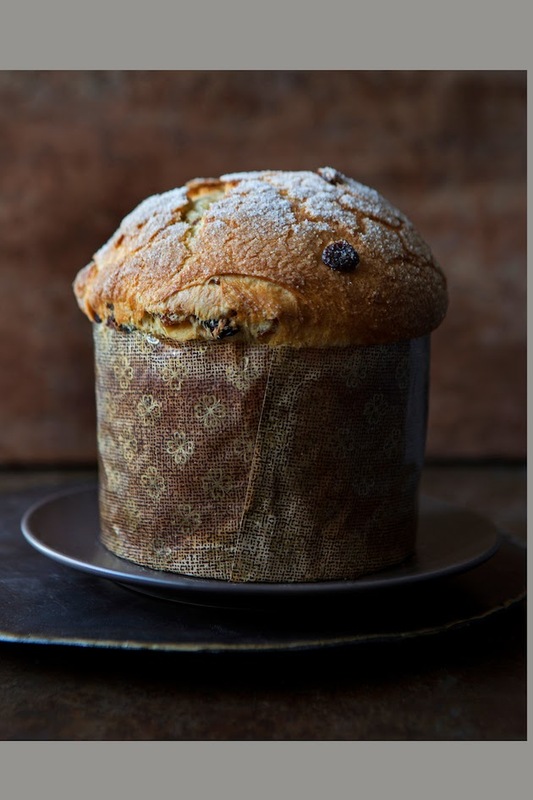 As an Italian, I am quite curious to try this panettone recipe. I usually get it in the store or in a bakery, but it sounds pretty easy to prepare so I will give it a try. My favorite non-traditional panettone is made with mixed berries instead of candied fruit. Thank you for this beautiful post. Ciao! I love to eat this and will try to make it. I just started baking bread again. This might be just the ticket to get my bread baking mojo back!! Thanks for the opportunity! I used to love baking bread, but it's too time consuming with a baby around. This book may be the solution we need. I've made panettone several times; started it in the bread machine to mix it and let it rise, then hand-shaped it, sometimes using panettone papers, and baked it. Wonderful. A variation is colomba, made at Easter, in the shape of a dove. I've made panettone several times, starting it in the bread machine for mixing and rising, then shaping it by hand (sometimes using panettone paper shells) and baking it. Colomba is a great variation, made at Easter, formed in the shape of a dove. This morning I baked carrot-cheese bread and it tastes awesome :) So delicious! My favorite bread of all time and I never thought of making it! I do love the first book in this series. I *LOVE* these books -- I give them as gifts, and mine are dog-eared! My favorite cook books of all time. I received this book as a birthday gift and have been baking bread ever since! So easy and delicious! I've since given this book as gifts and have converted my friends as well! My only personal baking experience is with quick breads, but my fiancée has gotten into baking all kinds of yeasted breads for us-- different kinds of baguette, sourdough boules (with our joint-effort homemade sourdough starter! ), sandwich breads, challah, ciabatta, etc... so I'd give the cookbook to her as a Christmas/birthday gift! I plan on trying the panttone recipe soon, I even found the papers! Oh Shulie, my husband is Italian and his absolute favorite treat is Panettone. I have always wanted to make my own for him!! Jeff and Zoe's cookbooks rock. I'm looking forward to seeing this new edition with more photos to tempt and inspire me! Honestly my bread baking can be a hit or a miss. I've had success with Hot Cross Buns, and then failed miserably on a simple loaf of bread. I am hoping to improve on this. I have recently become gluten free and appreciate so much, the new section in your updated edition. Love your techniques!! Wonderful recipe and story. Can't wait to try it! Another great recipe! Can't wait to fruit! My bread is typically too dense and lacks the airy texture I crave. I think baking bread nourishes the body and soul! I think baking bread nourishes both the body and the soul...smells good, too! I've been baking bread and pizza for years. Never tried to no-knead method though. Shulie, what a wonderful book… and that panettone, well that just made my day! My mother was an artisan baker and her Hungarian yeast cakes and breads included brioche and all kinds of deliciousness. I would love to win this book! The children and I bake bread almost daily. It's an integral part of our day, and our diets! I bake bread every so often, but it's been a while since it was part of my routine. I'm lucky enough to be able to buy some really good bread, but it would still be fun to experiment with my own flavour combinations. Gorgeous panettone Shulie! I'd never think about making it at home so it's great to hear how easy it can be. I'm curious about the gluten-free baking section and that's my biggest challenge when it comes to making yeast raised bread. wow what a gorgeous looking Panettone shulie. I wish I could have a bite right now. I used to not like baking bread back in college but I changed my attitude. My home smells so good with freshly baked bread, it's like a therapy. =) What a lovely giveaway and the best part is that it's worldwide! Cant wait to try this recipe! I am longing for this cook book! Only thing better than baking bread is sharing it! I'm cheating. I'm giving my 'old' copy to my daughter for Christmas so I can get the 'new' book! So if I win, then I can give her a 'new' book too. My favorite from the 'old' 5 Minutes a Day is the Caraway Rye. My favorite recipe from the 'old' 5 Minutes a Day is the Caraway Rye Bread. I'm a novice at bread making, but they make it easy. I love baking bread for my family because I like to know what is in it. The bread you buy from the market and even from bakeries has so many chemicals and additives when 5 ingredients gets you beautiful, delicious bread at home. I used to think making home made bread was hard until I got this book. It is so much easier than I thought. Thanks. Baking is everything to me...I don't remember the first time I baked something. Lets just say a have a picture of about 3 years old where I'm doing holiday baking. Something about making people happy and the smells it produces! I would love to improve my bread baking. This book is just the right way to motivate me! I wonder if this could be made in "miniature" using a popover pan. I don't have a brioche pan. Do you think it would work and if so, about how long would they need to bake? Hi Alice, I have baked this recipe in many sizes, so I am sure it will work. Depending on your popover pan, or you can use a muffin tin, I would think you'll need no more than 3 ounces of dough (about a plum-size piece), let them rest about 45 minutes and bake for about 30 minutes or until golden brown. The bake time will be shorter or longer depending on size of tins. I can't wait to bake from this book. I have not gotten around to making a pannetone as an Italian friend always makes it and gives me one each Christmas! This looks great Shulie and I am inspired! I love baking bread and have always been quite successful. But I have been trying to make this brioche recipe and haven't quite got it down after 4 tries! I have a book about baking French bread and I've tried at least have of the recipes in them. I have never tried to make pannetone, though. So, it's still something to have a go at. I have just made basic breads and I have never used a breadmaker before. Panettone is one of my favorite holiday treats and I'd love to make my own. It's not nearly as difficult as I thought.